Ladies, let’s discuss The Confidence Code. There’s the book, of course, and a lengthy excerpt appeared in The Atlantic a few weeks ago now. (Full disclosure: I have not yet had a chance to read the book yet, and suspect I won’t for a while. But the article is chock full of things to discuss — particularly among overachieving chicks like us.) Some questions at the start: Would you generally call yourself confident, or not? Do you consider yourself competent, particularly compared to your male coworkers or classmates? Have you found that your personal assessment has changed through the years (perhaps as you got farther away from school)? And here’s the important one: what changes have you made in yourself to address these challenges? What changes have you seen friends or coworkers make? (A flip side to the question: can you describe your most confident female friend or coworker? How can you be more like her?) (Stay tuned tomorrow when we have a more specific discussion about imposter syndrome — let’s try to keep the discussion today focused on confidence.) We’ve had some other great discussions before about Lean In, as well as our own Corporette take on where you think you’ll be in five years or ten years (inspired by a NYT article following up with women lawyers from 10 years ago) — I also think this book ties in a bit with Harvard Business School’s recent drastic efforts for gender equity. For my own $.02: I would call myself confident, but only to a point — I hold myself to fairly high levels of success and often feel like a failure when little things go wrong. Am I competent? As a lawyer I would rate my competence (or perhaps, more accurately, my confidence in my competence) somewhere in the middle of the pack, at least among the folks I’ve worked with and graduated with. As a blogger I would rate my competence much higher, but only because I know what my numbers are (traffic and money), and assume they’re good compared to most other bloggers. Still: I know I could be doing more, making more, bringing more traffic, and these things haunt me. To me one of the most interesting things about this topic is how the equation changes once women leave school — I call it “gold star confidence.” I’ve always been plagued by these insecurities, but they would abate once I got my gold star — my A in the class, my 100 on the paper, my good-enough LSAT/SAT/AP test score. I would think something like, “well, apparently my effort was good enough, even though *I* know I could have done more” and take that with me into the next round of classes, or to the next paper. On the flip side, once I began working (first as a journalist, then later as a lawyer), there were no gold stars. Particularly in BigLaw, there was just a lockstep paycheck and bonus with the rest of the lawyers in my class. My confidence got weaker without the constant stream of gold stars, and any “wins” we experienced seemed completely attributable to a group effort. As I’ve said before, part of the reason I like blogging and owning my own business is because I can focus on numerical metrics for success and give myself gold stars. If we’re just focused on confidence, that it’s really fascinating to think of the most confident people I’ve known. In my younger years, I think, I accepted confidence more easily — the older I get the more I view it warily. For example — if you have not read the Atlantic excerpt yet, go and do a word search on “Rebecca” and read the bit about the two hypothetical employees, Rebecca (quiet and careful) and Robert (bursting with ideas, many of them wrong and dumb). I have TOTALLY known many, many Roberts through the years — mostly men, but a few women. And of course they’re the ones who get ahead. But I don’t think to myself, “ah, he’s brilliant!” or “he deserves that promotion more than Rebecca!” But I admire him for his lack of self awareness, and ability to loudly stumble onto one or two great ideas, and, I suppose, for his lack of shame at wasting people’s time with the bad ideas. But then, I’m not sure I would want to live in a world full of Roberts — the Rebeccas are necessary to, you know, get stuff done and get it done right. So maybe we need the Rebeccas to stop enabling the Roberts — and, fine, fine, be a teeny, tiny bit more like them. I’m curious, ladies — what did you think about the article? Do you identify with the Roberts or Rebeccas more? Do you suffer from low confidence — and if so how are you addressing that? The article highlights something I find frustrating in the conversation- ok, men apply when they are 50% qualified and women when 100%. But are men more likely to get the promotion at 50% than women? Are women actually not lacking in confidence and needing to put themselves out there more but rather accurately assessing their opportunities. Good questions, Anne Shirley. I just printed the article to read and ordered the Kindle version of the book from my local library. I was discussing a related idea with friends this weekend. It was Friend’s observation (in her workplace, so ancedata) that men were more likely to get promoted on potential, but that women had to prove they’d earned the promotion. So, maybe the guy is getting hired with fewer qualifications because he has “potential” whereas the woman isn’t getting the benefit of that? I was considering this same phenomenon, but I look at it like this: if Man is 60% qualified and supremely confident, he probably doesn’t seem like a risk for promotion. However, if Woman is 95% qualified but less confident, she may still seem like a risk to promote. So , I think this confidence issue is related, but backs up the confidence theory. I also think that in the case of “stretch hires”, if the hire is a woman and she fails, then the senior people in that firm are more likely to think that women can’t do well in that role and to damn an entire group. If the stretch hire that failed is a man, it’s seen as an individual failure that doesn’t tar all the other men in the company as being unable to hack that role. For a really good discussion of this concept (Prove It Again Syndrome), check out “What Works for Women at Work” . Oops, accidentally reported, sorry Kat. I find the opposite to be true in my house, my husband won’t apply unless he’s fully qualified, but I don’t see the harm in sending an application if I meet about 75% of the requirements. And I would say my husband is very confident. I think he hesitates because he always tries to be perfect at his job And won’t take on one he knows he can’t do straight away. I haven’t read the book yet, but I definitely agree with your point about “Roberts” vs. “Rebeccas” — maybe women (as a group) can and should be more confident and self-promoting in the professional world, BUT I would really hate to live in a world full of “Roberts” without any “Rebeccas” for balance. I also think there’s an introvert/extrovert dynamic at work here – I know Susan Cain writes a lot about this sort of thing. +1. Both Roberts and Rebeccas can be balanced out by taking on a bit of the other’s behaviors. That being said, there is little downside to Rebecca growing out of her habits/comfort zone and cashing in on the goodwill her history of good work has created with her boss. Growing a thicker skin (specifically related to constructive feedback) and investing energy into getting more comfortable around her boss (stopping by without making appointment first, etc.) can only serve to open her opportunity landscape. Sorry about accidentally hitting “report” instead of “reply”! Would you generally call yourself confident, or not? I am very confident about some things–how I perform at my job, for example. I’m probably among the most confident people I know in those respects. I am not confident about other things and tend to worry that others don’t like me or enjoy working with me. Do you consider yourself competent, particularly compared to your male coworkers or classmates? Yes. I tend to think I am the most qualified/best at my role as compared to others, including male coworkers at or slightly above my level. Have you found that your personal assessment has changed through the years (perhaps as you got farther away from school)? Not really, although I doubted my competence less in school when I was being graded. With grades, it’s easy to know where you stand. With clients and other partners, I always worry that the bad outweighs the good. I thought I was but then I took their survey/quiz and NOPE. Per the survey, I have only a “middling” level of confidence. Although, it did say that could mean I’m really confident in some areas and really not in others, which is pretty much me in a nutshell. I don’t know what it says about me, but my survey result is that I am ‘highly confident.’ Hopefully, that doesn’t just make me a Robert! In thinking about it, I’m not sure that I am actually all that confident but I think I’ve always admired confidence as a trait and thus I have always tried to emulate it. So, if someone asks me to give a speech, it’s not that I’m not nervous about it or even have something to say but I want to be the kind of person that gives speeches and I force myself to be enthusiastic about it. Kind of like a fake it till you become it approach. That and maybe the results were skewed because I really love to play chess. What I don’t appreciate about many of these initiatives is that they focus on what women should be doing better, not on what men should be doing better. Maybe women as a whole are doing just fine with confidence, and in this instance, men should be more like women, and not have overly inflated confidence when that doesn’t reflect their actual competence. Women don’t always need to act like men to get ahead. I wish I saw more of the message from Sandberg and others that men have a lot to learn from women and that we aren’t always the ones that need to change. I think that both men and women have a lot to learn from each other but unfortunately, the message to women usually seems to be predominately that we are the ones who need to improve to be more like men, and not vice versa. I agree. Confidence is good a thing when you are pitching sound, evidence based ideas. (Over) confidence is troublesome when it prevents a person from adequately questioning they are on the right track, or accepting input from others. I agree. I think it’s problematic that we’ve set up this model for “success” as though it is a singular one, and the fact that it’s often a gendered model for success makes it even more problematic. I so agree with you on this EG. Men in my field tend to be overconfident. Almost without exception, my female colleagues (at my firm and others) are the real deal, very competant and client focused. While there are certainly men who are excellent as well, there are a certain cadre who can become sucessful with their good looks and their daddy’s last name or their previous professional sports career. I am a bit tired of being told to be more like men. That sounds great in theory, but what possible incentive is there for the man doing what works to do less of it? It’s not that we should act like men, it’s that we should do the things that are known to work. The incentive is for someone doing the promoting or hiring- if you learn how men and women present themselves differently, and you care about that knowledge (or your employer insists that you care), you’re better able to hire the most qualified person because you aren’t been swayed by confidence. I don’t think it’s about asking individual men to present themselves less confidently, it’s about asking decision makers not to reward confidence over skills. That makes sense, but most of these initiatives are geared towards individuals. Perhaps there should be a “beware of overconfident employees” initiative geared towards hirers. I hear you. I don’t interpret these initiative as “women should be more like men,” I view it as “if you want to be more successful, this is what you need to do” – not because it’s better but because it produces better results for the person. It’s also fine to say “why should I change? I think my approach is better” but then you have to accept that your approach may not lead to the results that you want. I think it’s even more meta than that. It’s also about a culture that seemingly values this breed of competence, at some level, over competence. Yes, educating decision makers is part of it, but it’s one small part. I still think part of it has to be not reinforcing the other message. Agreed. I didn’t get as far as I have by always thinking “what would a man do now?” but simply making the best decisions and choices that I could. I always appreciate advice and insight about what works, but I could do without the “this is what men do, so women should too” aspect. Men are predominant in a workforce because either: gender discrimination or because more men enter the field. (or, most likely, both). Thinking like a man may help in environments with established gender discrimination, but with an equal playing field successful women and successful men will both move up based on work and motivation. For example, I admittedly am one of the women who waits until they meet all or nearly all the criteria. I found it very interesting to find out that I should try when I meet more than half – but because it’s successful for *someone* not because *men do it*. Or, I found it helpful when I recent burst of articles talked about how many women don’t self-promote. I self promote more now, but because it’s objectively a good thing to do, not because men do it. This article just doesn’t resonate with me. 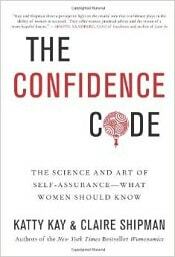 I know lots of “confident” women and lots of “unconfident” men. I know a lot of men who think they hung the moon when there is objectively not a lot to support that, but a lot of those men are the most insecure people I’ve met. I’m know slightly less women of the same variety. I do like the nod to participation in sports as a confidence booster–definitely agree. I was surprised to get “High Confidence” on the quiz, since I certainly suffer from impostor syndrome as much as the next high-achieving chick. However, one point in the survey I certainly felt confident answering- and I’ll bet it upped my score- was w/r/t confidence in opinions and sharing them. Outside of the workplace this is often a problem for me, as I get into arguments with say, in-laws, about an aspect of my field that I KNOW I’M RIGHT ABOUT, because I studied it extensively, know the inventor of a product personally, or keep up with the technology in publications, etc. I can’t stop myself from correcting people in these situations. In the workplace I think this is seen as plus for the most part – I’m not shy to share my experiences and I think in tech at least, more opinions are often better as new ideas are being thrown around, troubleshooting is happening, etc. I do feel lower confidence w/r/t “new tasks or problems”. I can’t tell you how hard my heart was beating the first time I had to lead a call, run due diligence on vendors, or interview candidates for a position I had sole responsibility over filling. I am terrified of screwing up in these situations where I have no clue what I’m doing. I hope I appear confident, but I really am terrified at doing new things where I have a potential to really mess things up for my company. I just got Low Confidence on the test, and now I’m really bristling at that. I think there’s a substantial difference between being confident that you can figure something out, have the tools to make competent choices, etc. -VS- I feel Very Confident that this number I just pulled out of thin air is in fact, the accurate age at which George Washington died. Overall, I do consider myself a pretty confident person. But, I also don’t need to be right all the time, or even feel like I am, which is what I think that test was measuring. There’s a difference between being confident and being right. I think the quiz just measured your decisiveness. Did you mark that you were “absolutely certain” that you didn’t know the population of Columbus, OH? Or that you were somewhat certain you didn’t know the population? I think the “somewhat” answers were the sign of lack of confidence (whether that’s accurate or not is another question), not the fact that you didn’t know the answer. I was very surprised at the number when I later googled the population of Columbus, especially compared to the other cities in Ohio. I was way off! I took the quiz and got “High Confidence,” which doesn’t surprise me. I’ve always had a strong sense of what I can and can’t do, and what I do and don’t know. I just don’t believe that a lack of confidence is what holds women back. I have personally been passed over for a well-deserved promotion while seeing equally-qualified, equally-confident men move up. In a sexist environment, a confident woman is a threat to the status quo. Yes, being confident is not some silver bullet. Now my problem is that I am a b!tch. Same here. I’ve realized through various portals of media that part of what is ailing me right now is that all my life, I’ve been told to be less. Less outspoken (seen and not heard), laugh less loudly (politely and discreetly, like a woman), less in size, less in needs, etc. How does that not kill confidence? Despite it all, I’ve been pretty confident in my brains and skills and ability to learn, and have been able to be almost perfect throughout most of my life but it’s backfiring now, in the practice of law, where there really is no perfect, and that gives me massive anxiety. I’m tired of such books where we’re pushed to act like men or the constant comparision with men. I do know and realize that their attitude and behavior, in some cases, works in bringing success quicker but I’m tired of analyzing their behavior and doing what they do to get where they are. Men and women are fundamentally different and I don’t think this is either good or bad. We can get better given society’s outlook towards women and the extra work we need to put in to overcome these but trying to emulate men is not the answer. May be we need to come up with a better approach to get ahead of them as opposed to analyzing them and trying to copy them. Why don’t we analyze men’s behavioral flaws and get ourselves to overcome them so that we can be way ahead of them? I completely disagree with your assertion that men and women are fundamentally different. The socialization we’ve all gone through in a gendered, sexist society is too powerful and pervasive for you to be able to say that there’s some essentialist difference. It’s too easy and simplistic and dangerous to make such an assertion and frankly smacks of the same kind of sloppy thinking that was used not too long ago by racists to assert that black people were somehow different in essence from white people. I disagree that men and women are fundamentally different, and that it should be noted. Besides everything Susedna said (and I agree with her), think of this: if men and women were fundamentally different, it gives every sexist environment the justification to prefer men over women when they can bring forward that this difference matters in a specific area. Then it would be justified to discriminate professional women solely because they are women, not because they lack competence, confidence or whatever else. I think, perhaps, there are things that men, on average, are better at and that women, on average, are better at – but that in no way translates to what a particular man or women is good at. And who knows how much of that is due to socialization ( for example – women that are good at math not pursuing math-heavy careers for reasons besides math-ability). And is different from fundamental differences. well considering that studies have shown that just reading something saying that girls and boys perform equally well on this math quiz, before giving the math quiz, actually DOES make the performance nearly equal (versus the same quiz without that statement) I’d say there’s a fair chance that nearly all of such differences on a broad basis are due to socialization and internalization of expectations. I share the concern about women being encouraged to become overconfident in order to be more like men, agree that it would be better if everyone was realistic about their own abilities, and also don’t think there’s much chance of change heading that direction. I’ll also complain from another angle: the comparison btw school success and work success. I actually think the academic system is better! If you do excellent work, you don’t have to advocate for your A and spin any bs- you just get an A. And aside from any extreme curve grading, everyone who does great work can get great grades; there’s no scarcity model where you have to compete on extraneous factors. None of this is true when you’re up for a new job or promotion. Ask A Manager has advised college grads that the standards at work will be higher than they were at school, but i disagree- I think they are lower and/or just less consistent. I also notice that competence does not win out, and I think this is why. I know we can’t recreate work in the image of school any more than we can make men imitate women, but if we’re talking ideals then these are mine. I got what I expected to get on this. One thing I do see is a lot of people (esp. women, but not exclusively) who want to be in a box that they regard as safe. So, a first year associate gets stuff handed to him/her to work on and their only job is to do the work well. That’s fine, but how do you grow from there? You have to take risks. If you do, you might fail, and a lot of people would rather be safe than wrong. I think law attracts a lot of people who have done what they were told to do, when they were told, and how they were told. They like certainty and, absent that, are comfortable with stasis. Other lawyers, say PI lawyers, have to make bet-the-house decisions every day: take this case, take this settlement, etc. It’s similar for small businesses: if you sign this lease, then you probably can’t take many others. Expand in this city or that city? If you open one door, you close others. You sometimes just have to make the best decision you can and then make it for all you’re worth (or decide that it’s doomed to fail and retreat). You don’t have to be the shark all of the time, but I’d urge people to try being the shark sometimes and see what happens. Also: play poker. I used to play in an all-guy group and it was eye opening (and my bluffing got way better). That said, I just applied for (and got!) a big promotion for which I met a little over half of the stated criteria. The backlash from my male peers has really surprised me since I had thought of myself as well-regarded among my peers. The negative talk has focused on the fact I am not “qualified” for the position. It really feels like they know they can’t be openly angry about the fact I, a young woman of color, got the position instead of them, middle aged white men, in 2014 so they focus on the safer rubric of “qualifications.” It has been very frustrating. I feel like this book doesn’t really address that problem. Going for the promotion doesn’t solve my workplace problem, it just trades them out for another set. – or, other people (women or men) who have their own reasons to understand the loneliness of being a demographic “outlier” within a professional community (the only person who isn’t straight? the only person whose religious holidays regularly collide with the work schedule? the only person who didn’t come from the same professional or educational background?) and who are willing to share ways they have learned to deal with the situation? Is it naive for me to advise you to continue being your same impressive professional self until you dazzle these resentful onlookers into silence if not approval? Or to kill these vultures with courtesy–while you also seek chances to take your successful behavior to a more congenial environment? Again, if I’m inserting foot or feet into mouth here, please tell me how not to repeat the behavior. I see this as being more of a “don’t expect the world to notice how great you are – tell them with your actions and words” read on confidence. I’m not sure I see the point of books like this one – but then I generally don’t have a lot of patience for books whose premise can be boiled down to 500 words or less and that are then just chapter after chapter of supporting anecdotes. To me, this is more or less French Women Don’t Get Fat or Rich Dad, Poor Dad – I tend to lose patience with this sort of thing. Although I did like Lean In for its autobiographical parts. I’m so glad you posted this! I was actually searching my email inbox searching for this particular TED talk that someone forwarded me and I couldn’t find it! This article made me think of it as well. Just like you said it’s important to harness the research for your own benefit. This TED talk made me much more aware of my own posture and how I want to project myself. And that’s a great take away from this article as well. It’s good to be aware that confidence is an issue. In law school this used to drive me crazy with moot court. We’d lose to teams that didn’t know that law as well but they sounded really confident and the judges ate it up because they didn’t know the particular issues well enough to question and point out that they were full of it. I’ll never purposefully be a “Robert” and totally full of it but at times when I’m wavering if I’m right or wrong I try to push myself to know that even if I’m wrong at least I’m brave enough to say something and who cares if I made a mistake. This looks great, thanks. Definitely an area where I can improve. Does anyone know of something similar for speech? I’ve pick up tips from observation, but I’d be interested in more. I’m not motivated enough to invest in a speech coach, though. Also, I agree this seems to be in the French Women Don’t Get Fat or Rich Dad, Poor Dad category. I’ts the Way You Say It, by Carol Fleming has been helpful to me. I bought it one day after realizing that one of the male partners I work with never listens to or remembers anything I say. I thought perhaps it was my delivery, and started reading the book. I’m not sure at this point whether it is my delivery, or my lady parts, that makes him ignore my thoughts, because I have largely avoided that partner since my epiphany. But I have appreciated the book’s guidance and expect it will come in handy in many situations. Thank you, AIMS, for posting that TED link! I’m preparing to go into a classroom with Senior Executives and teach about leadership. Imagine that – me – just a little cog in the wheel of “Giant Corporation” teaching our leadership about leading? Intimidating? Not any more! Love it! I’ve been reading the book off and on, I’ve found it difficult to stay engaged with it. I took the quiz, and I’m highly confident, which I am not surprised about. Anyone who knows me would agree I have opinions about everything! For me, the important part of confidence is being sure that I can handle almost anything that comes at me. So, I am confident of applying for a job where I meet only 50% of the qualifications not from an overdeveloped ego but because I am sure I will figure it out and do well. I do wonder if these scenarios play out differently in different fields. I’m a statistician, so managing uncertainty is a huge part of the job. I’ve worked with Roberts (men and women), and they are more often rewarded with a pink slip than a promotion. Confidence in my field plays out much more in having an attitude that assures reliability, trust, and competence. It’s not about making a claim and sticking to it regardless of the truth, which is what I see happening in the quiz. Being over-confident is a huge liability. However, I can imagine this playing out differently in law, marketing, sales, etc. I don’t know what the quiz measured. But based on the questions and the responses I gave (and I got “Highly Confident”), I think it measured how well you form conclusive opinions. I think that is essential in any job. If you don’t know something, you have to say you don’t know. I answered that I was “certain” that I didn’t know most of those questions, but I still got Highly Confident. In law, which is my field, you have to form an opinion. You have to. If you can’t develop the confidence to stick to a conclusion, then you won’t be an effective lawyer. That conclusion can be “based on my assessment of your case, you have a 50/50 chance of winning at trial.” The point is that you have to reach a conclusion, give advice, and stand by that advice. Confidence is not just being a yes man and plowing forward with unfounded opinions; but it is putting your opinion on the line and sticking to it. I recently saw Hillary Clinton give a speech. This post isn’t meant to be political, so just set that aside for a moment. She said something interesting: that over the years, she’s had lots of young people as employees, when she was in the law firm, as first lady, senator, secretary of state, etc. Over the years she has noticed that when she’s offering someone a promotion or an opportunity, that women often say something like “oh – do you think I’m ready for it?” whereas a male employee – never a question. I think to myself and my female colleagues and friends – and I think that is so true. Why do we doubt ourselves? Why do so many of us, in business meetings, sound so unsure of ourselves and our sentences have a doubtful, questioning quality? When I am among females I don’t see it as a lack of confidence, rather that we’ve been raised to value cooperation and friendship. But put us in a room with men (and often we are the minority) and it stands out like a sore thumb. I thought the Atlantic article was nuanced and, based on many years of working in different industries with many different people, quite perceptive and accurate. I get the impression that a few of the commenters here made their remarks after reading Kat’s synopsis and taking the quiz, but without reading the Atlantic piece or the book. Which if fine because it’s the Internet, I understand, and it’s still a good discussion, but it’s funny to me that people don’t seem to realize they are being Roberts (“I have opinions to throw out even though I have not taken the time to read the material”) as opposed to the Rebeccas they claim to admire. Anyway, I don’t think I will read the whole book but I thought the research cited in the Atlantic article was really worth pondering.